Newcastle upon Tyne ( ), commonly known as Newcastle, is a city in the metropolitan county of Tyne and Wear in North East England. It is situated on the north western bank of the River Tynes estuary and centred 8.5 mi (13.7 km) from the North Sea. 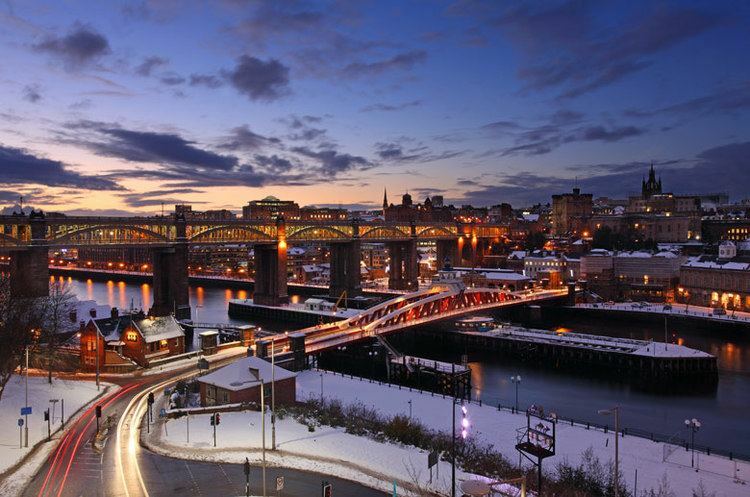 Newcastle is the most populous city in the North East region and lies at the urban core of the Tyneside, the seventh most populous conurbation in the United Kingdom and the most populous in the North East. 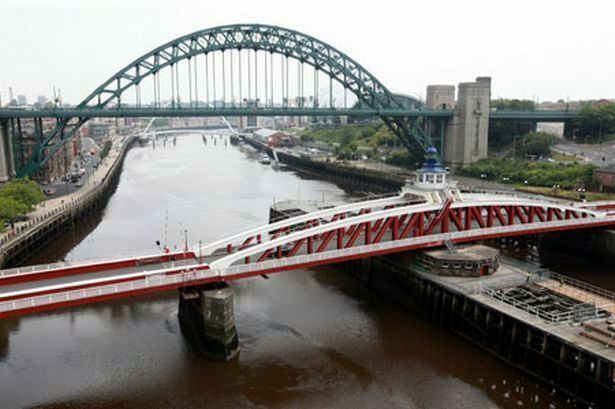 Newcastle is a member of the English Core Cities Group and, with Gateshead, the Eurocities network of European cities. 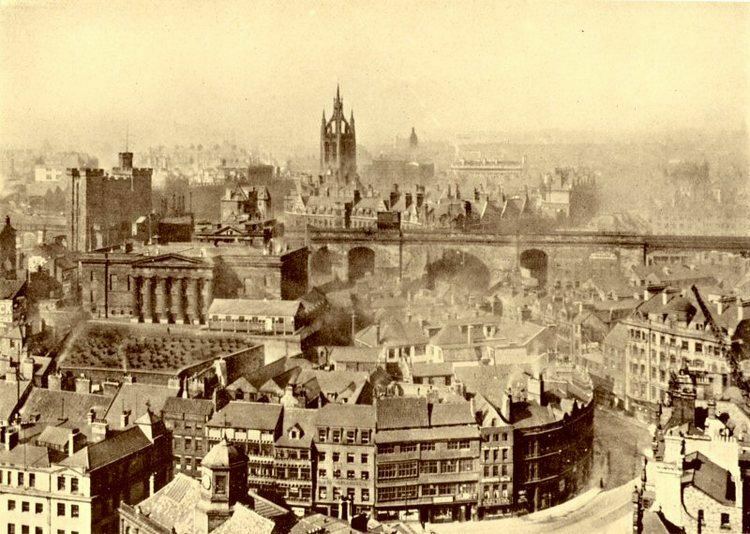 Newcastle was part of the county of Northumberland until 1400, when it became a county of itself, a status it retained until becoming part of the Tyne and Wear metropolitan county in 1974. The city developed in the location of the Roman settlement called Pons Aelius. It was named for the castle built in 1080, by Robert Curthose, William the Conquerors eldest son. The city grew as an important centre for the wool trade in the 14th century, and it later became a major coal mining area. The port developed in the 16th century and, along with the shipyards lower down the river, was amongst the worlds largest shipbuilding and ship-repairing centres. Newcastles economy includes corporate headquarters, learning, digital technology, retail, tourism and cultural centres, from which the city contributes £13bn towards the United Kingdoms GVA. Among its main icons are Newcastle Brown Ale, a leading brand of beer; Newcastle United F.C., a Premier League football team; and the Tyne Bridge. It has hosted the worlds most popular half marathon, the Great North Run, since it began in 1981. The first recorded settlement in what is now Newcastle was Pons Aelius, a Roman fort and bridge across the River Tyne. It was given the family name of the Roman Emperor Hadrian, who founded it in the 2nd century AD. The population of Pons Aelius at this period was estimated at 2,000. Fragments of Hadrians Wall are still visible in parts of Newcastle, particularly along the West Road. The course of the "Roman Wall" can be traced eastwards to the Segedunum Roman fort in Wallsend—the "walls end"—and to the supply fort Arbeia in South Shields. The extent of Hadrians Wall was 73 miles (117 km), spanning the width of Britain; the wall incorporated Agricolas Ditch and was constructed primarily for defence, to prevent unwanted immigration and incursion of Pictish tribes from the north, not as a fighting line for a major invasion. 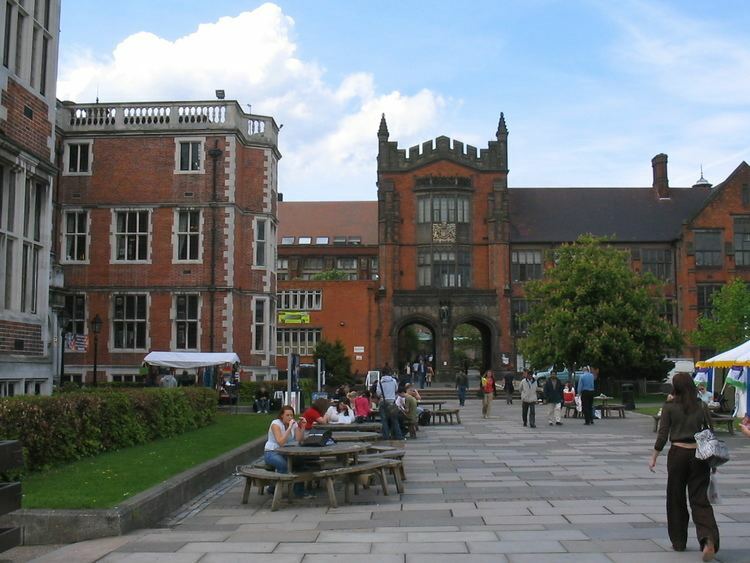 Newcastle is situated in the North East of England, in the metropolitan county of Tyne and Wear and the historical and traditional county of Northumberland. The city is located on the northwestern bank of the River Tyne at a latitude of 54.974° N and a longitude of 1.614° W.
In large parts, Newcastle still retains a medieval street layout. Narrow alleys or chares, most of which can only be traversed by foot, still exist in abundance, particularly around the riverside. Stairs from the riverside to higher parts of the city centre and the extant Castle Keep, originally recorded in the 14th century, remain intact in places. Close, Sandhill and Quayside contain modern buildings as well as structures dating from the 15th–18th centuries, including Bessie Surtees House, the Cooperage and Lloyds Quayside Bars, Derwentwater House and "House of Tides", a restaurant situated at a Grade I-listed 16th century merchants house at 28–30 Close. The city has an extensive neoclassical centre referred to as Tyneside Classical largely developed in the 1830s by Richard Grainger and John Dobson, and recently extensively restored. Broadcaster and writer Stuart Maconie described Newcastle as Englands best-looking city and the late German-born British scholar of architecture, Nikolaus Pevsner, describes Grey Street as one of the finest streets in England. The street curves down from Greys Monument towards the valley of the River Tyne and was voted Englands finest street in 2005 in a survey of BBC Radio 4 listeners. In the Google Street View awards of 2010, Grey Street came 3rd in the British picturesque category. Osborne Road came 4th in the foodie street category. A portion of Grainger Town was demolished in the 1960s to make way for the Eldon Square Shopping Centre, including all but one side of the original Eldon Square itself. Immediately to the northwest of the city centre is Leazes Park, established in 1873 after a petition by 3,000 working men of the city for "ready access to some open ground for the purpose of health and recreation". Just outside one corner of this is St James Park, the stadium home of Newcastle United F.C. which dominates the view of the city from all directions. Another green space in Newcastle is the Town Moor, lying immediately north of the city centre. It is larger than Hyde Park and Hampstead Heath put together and the freemen of the city have the right to graze cattle on it. The right incidentally extends to the pitch of St. James Park, Newcastle United Football Clubs ground, though this is not exercised, although the Freemen do collect rent for the loss of privilege. Honorary freemen include Bob Geldof, King Harald V of Norway, Nelson Mandela, Bobby Robson, Alan Shearer and the Royal Shakespeare Company. The Hoppings funfair, said to be the largest travelling fair in Europe, is held here annually in June. In the south eastern corner is Exhibition Park, which contains the only remaining pavilion from the North East Coast Exhibition of 1929. Since the 1970s this has housed the Newcastle Military Vehicle Museum; this is closed until further notice because of structural problems with the building—originally a temporary structure. Newcastle played a major role during the 19th-century Industrial Revolution, and was a leading centre for coal mining and manufacturing. Heavy industries in Newcastle declined in the second half of the 20th century; office, service and retail employment are now the citys staples. The city is also today recognised for its commitment to environmental issues, with a programme planned for Newcastle to become "the first Carbon Neutral town". Newcastle was in the top ten of the countrys top night spots, and The Rough Guide to Britain placed Newcastle upon Tynes nightlife as Great Britains no. 1 tourist attraction. In the Tripadvisor Travellers’ Choice Destination Awards for European Nightlife destinations, four of the UKs nightspots finished in the top 10; Newcastle was awarded 3rd Place behind London, and Berlin. Newcastle also came in seventh for the World category. There are concentrations of pubs, bars and nightclubs around the Bigg Market, and the Quayside area of the city centre. There are many bars on the Bigg Market, and other popular areas for nightlife are Collingwood Street, popularly referred to as the Diamond Strip due to its concentration of high-end bars, Neville Street, the Central Station area and Osborne Road in the Jesmond area of the city. In recent years "The Gate" has opened in the city centre, a new indoor complex consisting of bars, upmarket clubs, restaurants and a 12-screen Empire multiplex cinema. Newcastles gay scene - The Pink Triangle - is centred on the Times Square area near the Centre for Life and has a range of bars, cafés and clubs. The city has a wide variety of restaurants such as Italian, Indian, Persian, Japanese, Greek, Mexican, Spanish, American, Polish, Malaysian, French, Mongolian, Moroccan, Thai food, Vietnamese, Lebanese. Newcastle is one of 7 cities in the UK that has a Chinese village with many Chinese restaurants on Stowell Street. There has also been a growth in premium restaurants in recent years with top chefs. In January or February, Newcastles Chinatown is at the centre of a carnival of colour and noise as the city celebrates the Chinese New Year. In early March there is the NewcastleGateshead Comedy Festival, this event makes a return to the region since the last event in 2006, it is hoped it will now continue as an annual event. The Newcastle Science Festival, now called Newcastle ScienceFest returns annually in early March. The Newcastle Beer Festival, organised by CAMRA, takes place in April. In May, Newcastle and Gateshead host the Evolution Festival, a music festival held on the Newcastle and Gateshead Quaysides over the Spring bank holiday, with performances by acts from the world of Rock, Indie and Dance music. The biennial AV Festival of international electronic art, featuring exhibitions, concerts, conferences and film screenings, is held in March. The North East Art Expo, a festival of art and design from the regions professional artists, is held in late May. EAT! NewcastleGateshead, a festival of food and drink, runs for 2 weeks each year in mid June. The Hoppings, reputedly the largest travelling fair in Europe, takes place on Newcastle Town Moor every June. The event has its origins in the Temperance Movement during the early 1880s and coincides with the annual race week at High Gosforth Park. Newcastle Community Green Festival, which claims to be the UKs biggest free community environmental festival, also takes place every June, in Leazes Park. The Northern Rock Cyclone, a cycling festival, takes place within, or starting from, Newcastle in June. The Northern Pride Festival and Parade is held in Leazes Park and in the citys Gay Community in mid July. The Ouseburn Festival, a family oriented weekend festival near the city centre, incorporating a "Family Fun Day" and "Carnival Day", is held in late July. Newcastle Mela, held on the late August bank holiday weekend, is an annual two-day multicultural event, blending drama, music and food from Punjabi, Pakistani, Bengali and Hindu cultures. NewcastleGateshead also holds an annual International Arts Fair. The 2009 event will be in the Norman Foster designed Sage Gateshead Music and Arts Centre in September. In October, there is the Design Event festival—an annual festival providing the public with an opportunity to see work by regional, national and international designers. The SAMA Festival, an East Asian cultural festival is also held in early October. There are several museums and galleries in Newcastle, including the Centre for Life with its Science Village; the Discovery Museum a museum highlighting life on Tyneside, including Tynesides shipbuilding heritage, and inventions which changed the world; the Great North Museum; in 2009 the Newcastle on Tyne Museum of Antiquities merged with the Great North Museum (Hancock Museum); the Gallagher & Turner Gallery; the Laing Art Gallery; The Biscuit Factory (a commercial gallery); Vane; Seven Stories a museum dedicated to childrens books, the Side Gallery historical and contemporary photography from around the world and Northern England and the Newburn Hall Motor Museum.